oh so tempting. looking forward to the reviews. Yay for The Knife of Never Letting Go and Unwind! I read Unwind for RaT and really liked it. Definitely a creepy read! I'm *so* looking forward to your reviews of these! The only one I haven't read is The Knife of Never Letting Go which is in my TBR pile. Skinned I really liked, and Genesis I thought was a work of genius. 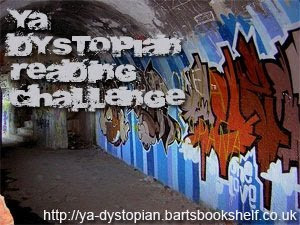 Dystopia *rocks*. This sounds like a really cool week...but I do think most teen novels can qualify--even if the dystopia is only a matter of perspective rather than literal creation. I think my reviews of the Collins book will be up this week too! And I have Uglies in my pile, waiting to be read. So I too will be looking forward to your reviews. Welcome aboard! I hope you enjoy my reading challenge!